11.16.10 Six players gathered in Aroostook County on November 13th, 2010 to compete in the Seventh Presque Isle Open. Roger Morin took first place with 3.5 points in four games. 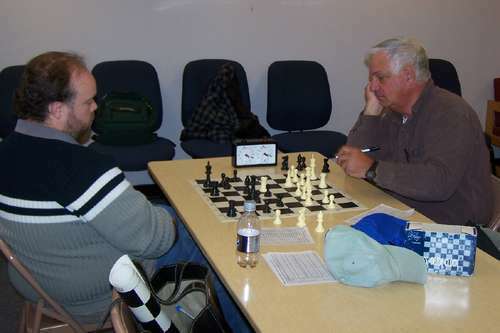 In this report you'll find photos from the tournament, the USCF crosstable and a selected game. 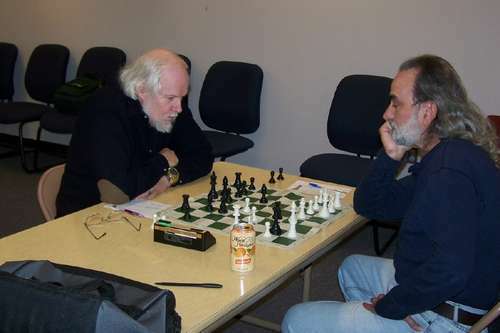 Tournament winner Roger Morin (left) plays Ray Haines in second round of the Seventh Presque Isle Open. Roger Morin (1934) took his first three opponents in rapid fire then held on to draw his last round game to come away from the tournament in clear first. Following Morin in second place was Ray Haines (1823) with 3.0 points. Richard Fontinha (1734) and Lance Beloungie (1694) tied for third/fourth place each scoring 2.0 points. Roger Hardison (1528) took fifth with 1.5 points and Craig Fournier (1150) went scoreless to round out the crosstable.